In the world of online casinos there are some who get a head start, riding in on the coattails of a well-established parent company. We’re talking about such giants of the industry as William Hill, Ladbrokes or Bet365. Others don’t have that same name recognition, so they’ve got to work extra hard to make a name for themselves and earn both your business and your trust. It’s certainly not the case that one type of casino is ‘better’ than another. Some of those that are linked to a top brand in the betting world might not actually be that much fun to use, for example, whilst another that isn’t a household name might offer a user experience that’s second-to-none. It’s all about personal preference, so the best way to find out what you like is to use numerous different casinos and see what sticks. If you’re going down that road then you’ll definitely want to make sure that you find time for Prospect Hall, a new-style of casino that was set-up in 2015. Don’t let that fool you into thinking that there’s no experience behind the enterprise, however. Prospect Hall is owned and operated by Betable Limited, which has been around since 2008, and offers a premium range of games from providers you will recognise, as well as a few Betable exclusives. There is a touch of magic about this one, and if you like to play table games you will definitely want to take a look. As you know, most online casinos don’t actually create their own games. Instead they bring in help from outside companies that specialise in online casino gaming, which is why you’ll often see so many of your favourite games available via numerous casinos. One of the ways that one online casino can attract customers is by using a broad range of providers, which is precisely what Prospect Hall have opted to do. Ash Gaming, NetEnt, Play N’Go and Playtech provide the entertainment at Prospect Hall, numbering a respectable 250 games in total. These can all be filtered by provider – which is perfect if you happen to love a particular game that you know is from the Ash Gaming repertoire, for example – minimum wager, and RTP. 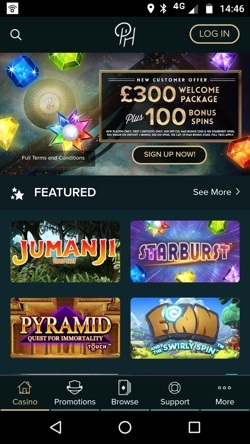 The majority of games here are provided by NetEnt and Play n’Go, but Ash Gaming has a unique take on slots which gives Prospect Hall a fun twist when it comes to their options. Prospect Hall’s interface uses the increasingly popular HTML5, meaning that the games offered are Instant Play rather than download. Speaking of the interface, it has been laid out on top of an otherworldly backdrop, depicting a dreamlike scene of aliens, dinosaurs and humans going about their day. It’s as if our world and the iGaming world have become one. This cleverly adds interest to what might otherwise be a pedestrian offering visually. The simplicity does have the benefit of making the site super-fast and easy to use, however, so you won’t have trouble finding your way around, but it is noticeably feature light if you have ever played elsewhere. 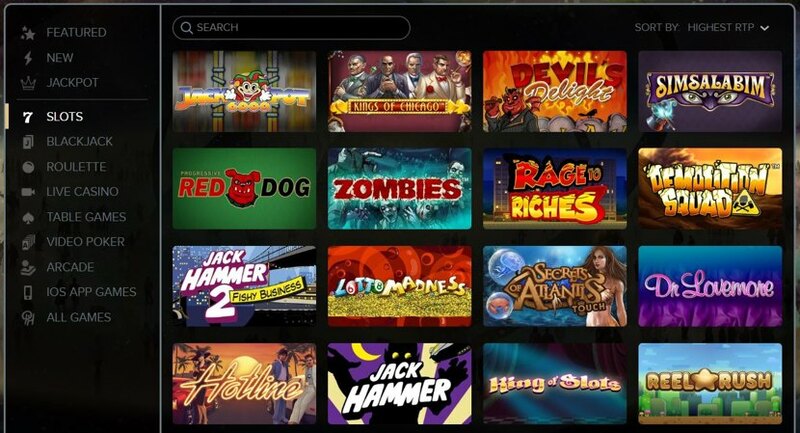 Slots – Since there are just shy of 200 slot titles available, you can have a lot of fun exploring them. Dead or Alive and Demolition Squad are two popular NetEnt titles to get you started. Jackpots – The good news is that Cosmic Fortune, Divine Fortune and Innocence or Temptation are all available. The bad news is that they are it. 3 Jackpots only. Live Casino – NetEnt power the Live Casino with 12 tables split between Roulette and Blackjack. It’s a decent offering but there isn’t much variety. Still, if you like the classics you will be well looked after. Roulette – Fishing Roulette is an exclusive Betable title and one of the 11 Roulette variations on the site. Perhaps a lucky find if you have been angling for something unique. Blackjack – There are 11 Blackjack variations as well, with plenty of low limit tables so you can get involved even on smaller budgets. Table Games – A heavy handful of 15+ table games provides plenty of scope with Pai Gow Poker, Beat Me, and 3 Card Brag peaking our interest. Video Poker – If Video Poker is more your thing then Deuces Wild, All American Double Up or one of the other 7 titles should keep you happy. As you can see, no frills doesn’t necessarily mean low quality. The move over to HTML5 has found one particularly large benefit for online casinos in terms of how much easier it’s made playing games on mobile devices. In fairness, the Prospect Hall site isn’t exactly the most graphics-intensive one even if you’re on a desktop computer, so the move to a phone or tablet isn’t likely to cause you major issues. That said, there is a mobile app that you might want to use if you tend to prefer that sort of thing to using sites that have been optimised for mobile browsers. In fact, there’s an argument to suggest that the app offers a much more visually pleasing experience to both the full site and the mobile version, but it’s only available on iOs, so Android users are out of luck. The mobile site is a lot of fun to use, utilising a spinning wheel of fortune as a category selection tool which instantly takes you to the sort of games you are looking for, and actually, the whole thing takes on a more classical vibe on the small screen. You will barely notice a difference in game numbers but you will notice the slick and stylish design and execution of this product. Prospect Hall know that it’s best for their business if it’s nice and easy for you to deposit money into your account. Consequently, there are numerous ways to do just that, though not as many as with some of the biggest companies. There are no nasty fee’s to watch out for other than the early withdrawal fee of £3. This only applies if you deposit £10, for example, only wager £8 and then request a withdrawal. If you’re unsure then it’s best to head to the website and check or, at the very least, contact the company’s support network. Betable Limited started life as an online gaming and betting site back in 2008. It wasn’t until four years later that a decision was taken to move into the world of providing its own gaming platform. They quickly became a very well respected games provider and it was this experience that led those behind the company to believe that they would be able to make an exciting online casino that would interest bettors. That’s why they chose to launch Prospect Hall in 2015, feeling that a mix of games from some of the biggest names in the business along with exclusive titles of their own was a great way of separating themselves from the crowd in a popular industry. ‘Built with the players in mind’ is Prospect Hall’s tagline, which probably tells you everything you need to know in terms of what to expect from the gameplay and the layout of the site. Prospect Hall isn’t Betable’s only product that you might have come across. Bingo Lounge, Casino Cash, 3oak Casino, Bee Cave Blackjack and Lootwinner also come under the Betable umbrella, just so you know for the future. Being a newer and therefore smaller casino, Prospect Hall are understandably going to be more limited with their customer support options. However, that’s not to say they don’t deliver. The Live Chat is only available 8am – 10pm but you will usually be connected instantly, and the staff are great. There is also an e-mail option, and using either of these options is easy if you select the Support button at the bottom of each page. The Contact Us, FAQ and Terms are all contained within the same area which keeps things together and enables swift support when it’s necessary. If they extended the FAQ they would be doing themselves a favour in terms of how much contact they have to deal with, but it answers the basics. Live Chat – We would suggest this as the best contact option. Find Support at the top or bottom of the page and you will be able to use Live Chat immediately. E-mail – support@betable.com is the address to use, or you could opt for the contact form on the site. The result is the same. @theprospecthall – This account seems to be active and interesting, providing extra’s and info every few days.